A wonderful keepsake for the new baby! 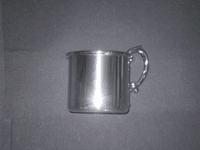 Lovely pewter cups with a polished finish and decorative handle. Perfect for personalizing with the baby's name and birth date. For more detailed information regarding how we engrave please see the Personalization Page. The Baby Cup Brite has a hollow handle. 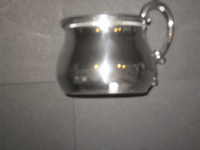 Height 2 11/16" Diameter 2 9/16"
The Bulged Beaded Border Cup has a hollow handle. Height 2 11/16" Diameter 2 9/16"